Discussion in 'Aion Innovation' started by Aion Innovation, Nov 30, 2018. I'm putting up this thread so that you all can post your thoughts and pictures of my first product The Triune Pen. Feel free to ask me and other customers questions on this thread to help make your decision about buying one easier. 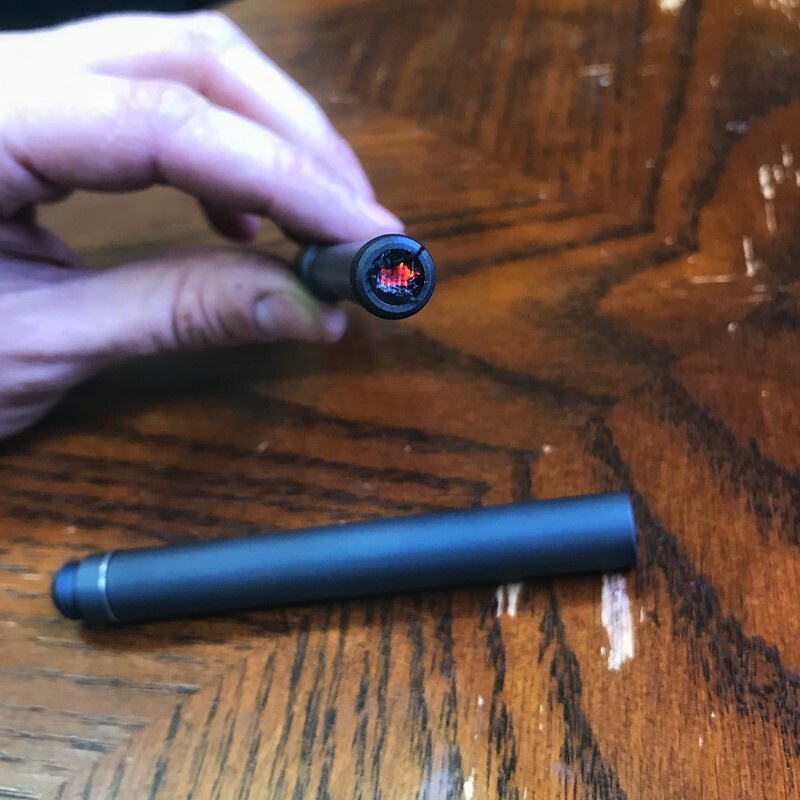 I also have review section to my website for everyone to post their thoughts on the Triune Pen and their experience working with me and my company. I would appreciate it, if you all would leave a review to help me out as I continue to grow my business. Use these links and scroll to the bottom to add your reviews. Caveman Cracker, Gii shi kan dug, R Stowe and 1 other person like this. I received mine today and on the 3rd and 4th tries got embers. While I'm not master, I think that roughing up the char cloth, resting the pen on a solid surface, and striking with a quick but not jerking motion, followed by a smooth return gets the best results for me. Two hands seem to make a difference for me, even though it doesn't feel like it did. So far I'm having 50/50 and maybe even closer to 60/40 success on ignitions. I'm looking forward to more practice, experimenting with other materials, and of course, starting some fires. Outside of the obviously well designed fire piston, it's a well made pen altogether. This pen will definitely be joining these two items I carry every single day. itsken78, C Bryant, Usingmyrights and 5 others like this. Aion Innovation, ArmyMacE and R Stowe like this. Mail Call from @Aion Innovation !!! itsken78, 08H3, Tangotag and 2 others like this. Next to my back ups that are new. Every man needs a good writing utensil. It needs to have an elegant style, yet be robust enough to last. The newest addition is the Triune pen from @aioninnovation , the smaller two are ones I have utilized for many years from Rite-in-Rain. After a short time tinkering with the Triune I believe it will serve the role quite well, with the added addition of being a multi use tool. I am looking forward to seeing how these hold up. They feel and look amazing! itsken78, C Bryant, Usingmyrights and 2 others like this. Thank you so much for posting the pictures! I truly appreciate your support! Love it. Gave it to myself for Christmas, so I didn't get a chance to play with it until recently. With a little bit of practice, I'm getting coals pretty much every time now (I've probably just cursed myself.) Key is lubrication. I use my lip balm. 1. Turn the clip around before plunging and you can use the clip as a pick to get the ember out and into your bundle without ripping it apart. 2. Use the hollow shaft of the pen as a pocket bellows to increase oxygen flow over your ember and/or tinder bundle. Quality is absolutely top notch. I have lots of ideas. 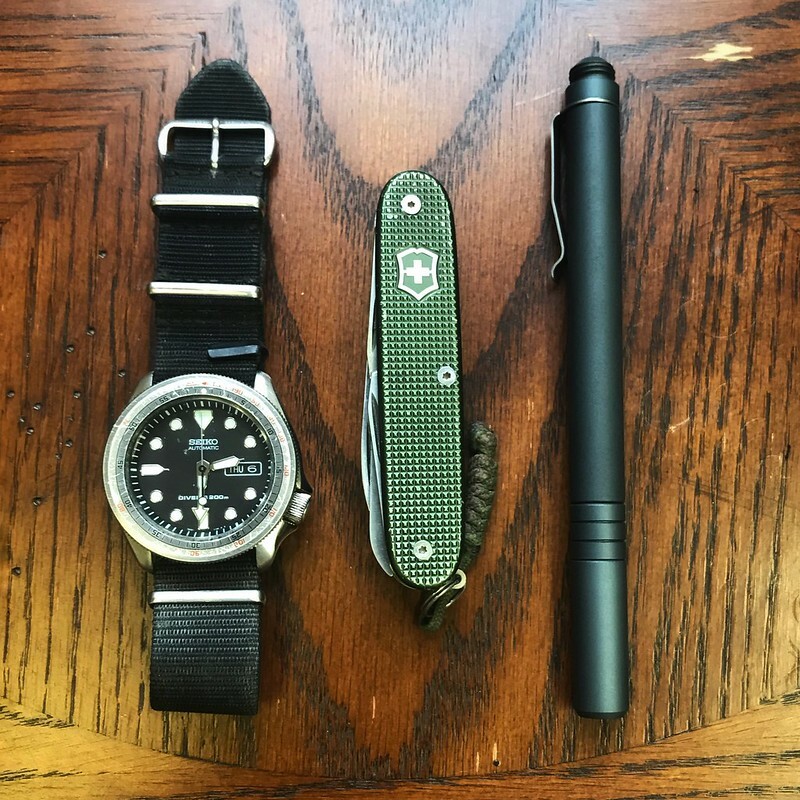 First I think you've already addressed: I need one in orange to match my SAK Farmer alox . You could also think about interchangeable ends to swap in/out with the glass breaker. A lanyard hole. A whistle. A scraper for processing inner bark. You could even just make ends in different colors as accent pieces. Collect them all! But seriously. An orange pen. I'm throwing money at my computer screen trying to make it appear. itsken78, Youcantreadinthedark, 08H3 and 6 others like this. @NotThatMatt That is so awesome to see you using all of the tools provided in the pen. I like the idea of using the tube as a bellows too. Great tips Matt, thank you for the feedback. I have also tried to use the pen tube as a mini blow gun and a straw as well. I have also experimented with the cap as an emergency whistle by taking out the rubber plug and tinder and then blowing across the top of it. Its pretty loud, but I'm not sure if it is as loud as other whistles on the market. Some of you try it and let me know if you think it could be marketed as one of the features. Thank you for the other ideas. I will play around with them and see what can be done. As for the colors I will ask my anodizer to see what colors he has to offer and maybe get 10 or 20 of the orange and olive drab done. What are your thoughts on making the threads on the cap triple lead threads so it unscrews in less than one rotation. I have had several people tell me that they would like the cap come off quicker for general writing use. Usingmyrights and ArmyMacE like this. Didn't even think of that. Holy cow, it's actually pretty loud. I would definitely mention it as a feature. Bit of a challenge removing plug/char before using in an actual emergency, but effective nonetheless. What are your thoughts on making the threads on the cap triple lead threads so it unscrews in less than one rotation. Hmm, hadn't given the cap much thought. But now that you ask, I'm sure I can form an opinion. Just my personality, but I lean towards keeping the threads the way they are. Less than one turn, in my mind, means greater chance of losing the cap. And in this pen, the cap is integral to the functionality. So, to me, threads = integrity. I'm sure others may have differing opinions. Just my few cents. I only just discovered that the tinder cup unscrews as well, and the clip can serve as a screwdriver to remove the ink cartridge seat, leaving the inner tube hollow. With the extra o-ring provided, the two tubes can be held together to double the length of the bellows, as well as provide a slight narrowing/acceleration effect for the air. (Or double the barrel of your blowgun.) This thing is turning into the Inspector Gadget pen! Now I just need to figure out how to fit rotor blades in there somewhere ... Go go gadget -- helicopter! itsken78, beestokk and ArmyMacE like this. How about a matching .5 mm mechanical pencil? This post is simply a thank you. You helped me reach a personal milestone. I've never been able to get an ember from charred punk wood using a piston before. I've heard tell of it being done in the wild, but it has always eluded me. Charred cloth no problem, but natural tinders never happened for me. I'm no expert, and I wouldn't bet my life on conjuring one, but I've been able to repeat it a few times. Very satisfying! itsken78, Tangotag and ArmyMacE like this. @NotThatMatt That's awesome that you got the punkwood to ignite. I have also heard that chaga ignites pretty easily but sadly it doesn't grow near me. I might have to buy some and try it out. I also agree with you on the security of the threads. Most of the people that mentioned it to me were used to using clicker pens and so they valued the convenience over the security. First test of the Aion Triune Pen. Testing out the fire piston portion of the Aion innovation Triune Pen. Keep in mind this is my first time utilizing a fire piston. This is also the first time I’ve used this portion of the multi functional design of the Triune Pen from Aion Innovation Needles to say this is a well thought out and developed product. itsken78, C Bryant, Winterhorse and 2 others like this. I'd burn my office down with that. My ferro rod necklace gets me in enough trouble. Winterhorse, Tangotag and ArmyMacE like this. @ArmyMacE Awesome thank you so much the review and video. I'm glad to see you got it to work! I know you gifted a bunch of them for Christmas. How did everyone like them? I bought one off the scratch & dent sale. It produced multiple embers the first night use as I got things figured out. My wife thanks you @Aion Innovation for how "her kitchen" smelled that night. itsken78, C Bryant, Winterhorse and 1 other person like this. @Tangotag Oh man I know all about messing with the wifey's kitchen. Haha Tell her the smell of burnt char cloth will grow on her. I'm glad you successfully got the fire piston to work. Once you get the feel for the speed and force needed, I find that its pretty reliable method of getting an ember. If you would be so kind, I would so appreciate it if you left a review on my website. I'm trying to build up some reviews before I run my next ad on Instagram. ArmyMacE and Tangotag like this. Bad camera work, great fire piston. I have yet to have a misfire with this thing, even working this quickly with it. itsken78, ArmyMacE, C Bryant and 1 other person like this. @Youcantreadinthedark Sweet, glad to see you got the technique perfected. Thank you for the post/review. Chaga worked like a charm! itsken78, ArmyMacE and beestokk like this.